Nestled in the center of four Interstate highways, Randolph County offers unparalleled logistical advantages for business offering easy access to workers and raw materials and the ability to ship products worldwide. U.S. Highway 219 bisects the county connecting Interstates 68 to the north and 64 to the south. U.S. highway Corridor H (U.S. 48) is an interstate-grade divided highway that connects the county to Interstate 79 to the west. Within a few years, Corridor H will connect directly with Interstate 81 east of the county offering easy access to the Virginia Inland Port at Front Royal, Virginia and deep water ports along the eastern seaboard. The Virginia Inland Port – a U.S. Customs-designated port of entry – offers intermodal container transfer services to markets worldwide. The Durbin & Greenbrier Valley short line railroad connects to the CSX mainline just west of Randolph County. Together, these railroads give Randolph County businesses access to major markets throughout the eastern third of the U.S. and Canada and international markets from East Coast ports. Randolph County is centrally located between two international airports, both less than three hours away. Pittsburgh serves as the region’s international air cargo and has three parallel runways and all-weather operating capabilities. Yeager Airport in Charleston, West Virginia also offers four air freight carriers to meet your shipping needs. 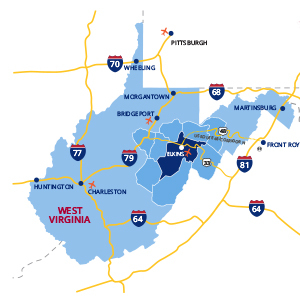 For corporate executives requiring jet landing capabilities, the North Central West Virginia Airport at Bridgeport is just a short drive away. The Elkins-Randolph County Regional Airport offers additional options for tourists and regional travelers who want to explore the area from within the heart of the county. Our network of state and interstate highways, railroads, and airports connect businesses here to the world. Click here to learn more about how you can get connected to markets anywhere from Randolph County!